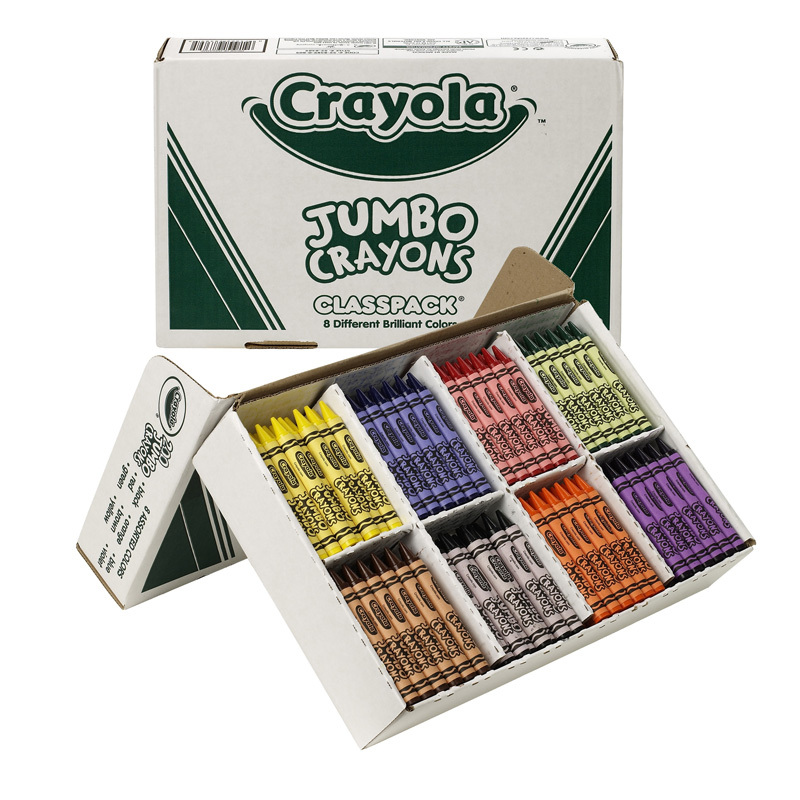 Crayola Crayons provide color-loving kids with 16 hues that feature vibrant, long-lasting color. Amp up school projects and artistic endeavors with high-quality results. 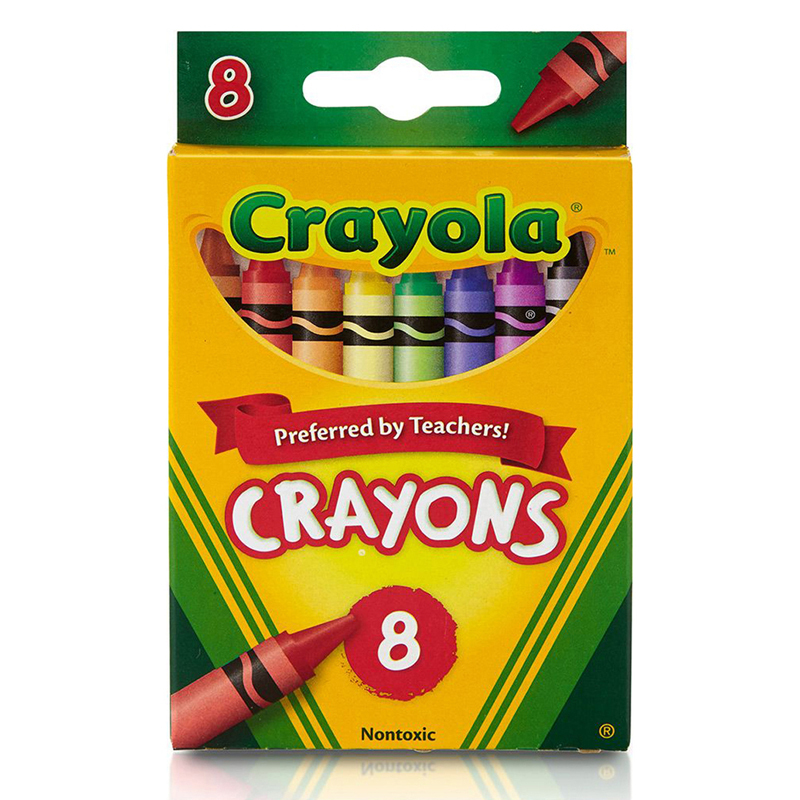 Kids will love to use these vividly colored, durable crayons at school. The original 8 Crayon colors are included, as well as, in-between hues like Carnation Pink and Blue Green. Crayola Crayons can last 35 percent longer, based on square foot coverage against key competitors. Children can enjoy drawing more pictures and filling coloring books even longer. Crayola art supplies and activities help children express, create, and connect through colorful play. 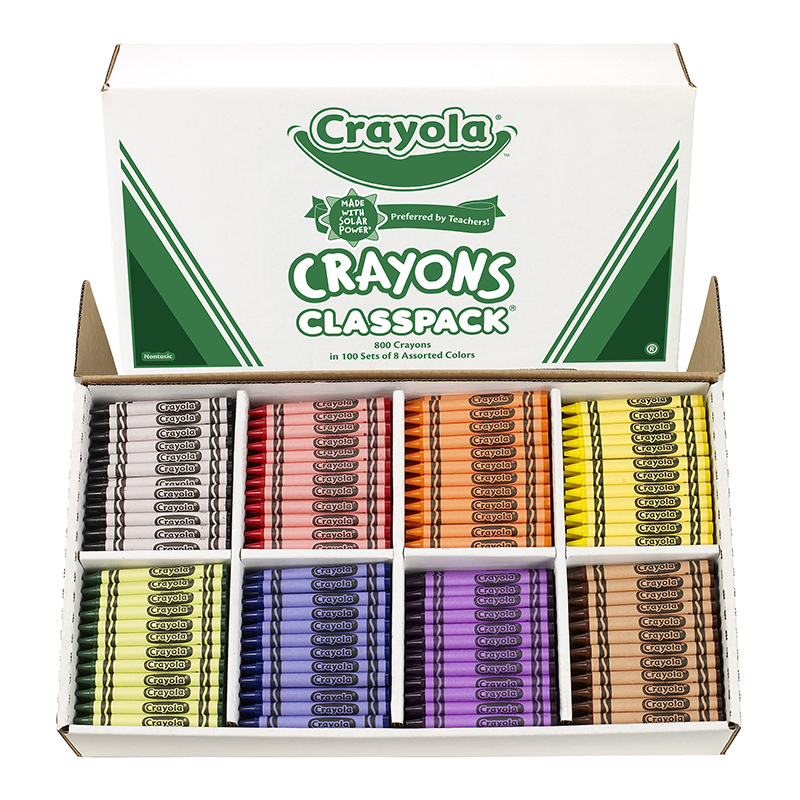 This bulk Crayon Classpack includes enough supplies for the entire class! A total of 800 crayons are included in this set. There are 50 crayons in each of the following 16 colors: Yellow, Blue Violet, Blue, Blue Green, Carnation Pink, Red Violet, Green, Brown, Yellow Orange, Red Orange, Yellow Green, Red, Black, Orange, White and Violet. 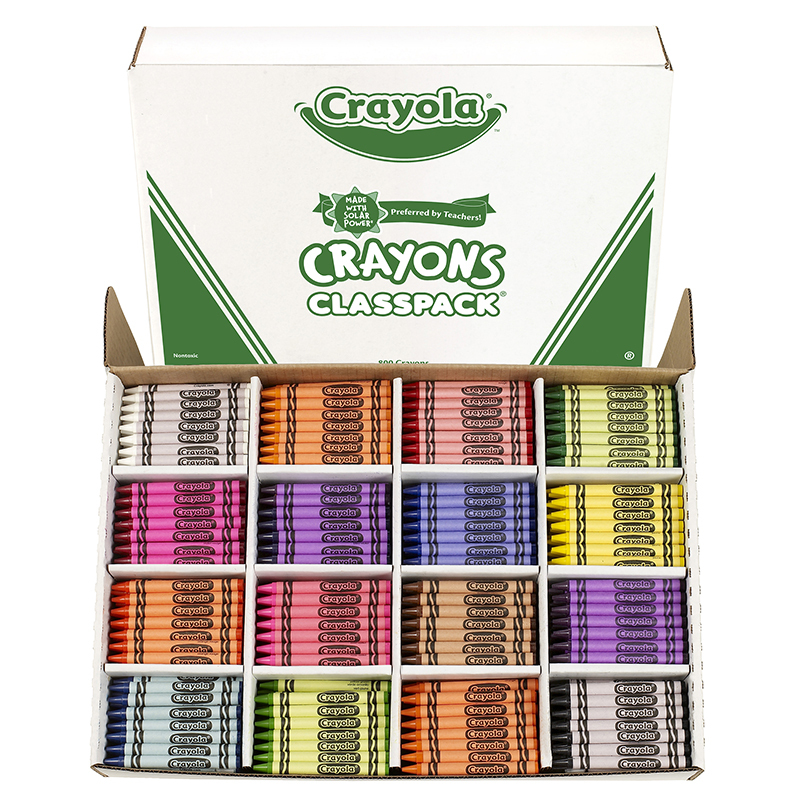 The Crayola Crayons Classpacks 16 Colorreg Size 800 Crayons can be found in our Crayons product category within the Arts & Crafts. Crayola Classpack Regular Crayons, 16 Colors, 800/BX Get the whole class coloring with Classpack crayons. Color assortment is brilliant and vibrant. Economical solution for replenishing your classroom's crayon supply. Color(s): 16 Assorted; Assortment: 50 Black; 50 Blue; 50 Blue-Green; 50 Blue-Violet; 50 Brown; 50 Carnation Pink; 50 Green; 50 Orange; 50 Red; 50 Red-Orange; 50 Red-Violet; 50 Violet; 50 White; 50 Yellow; 50 Yellow-Green; 50 Yellow-Orange; Crayon Size: 3 5/8 x 5/16; Size Group: Standard. Economical. Get the whole class coloring with ClasspackR crayons. Color assortment is brilliant and vibrant. Economical solution for replenishing your classroom's crayon supply.